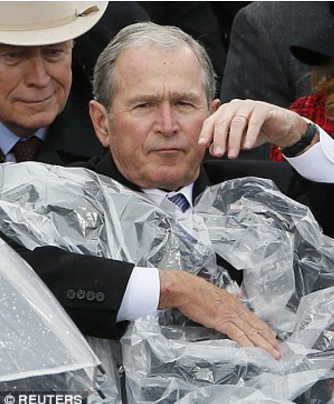 While we were all laughing at former President George W. Bush’s dalliances with his rain poncho during the inauguration of the 45th president, Bush was one step ahead of all of us, as usual. You see, this rain poncho is actually a portal to another world, and this second world is owned by nobody: it’s called No Man’s Land. Bush was very nervous about a potential orange presidency, and thus decided that he needed to find an escape. So he used his strategery to develop a secret portal into an alternate universe and to forever escape the nastiness of Trump. But as with portals to alternate universes, things didn’t go quite like he had planned, and he ended up spending most of the fateful day struggling to execute the daring escape. Let’s zoom in on these images to get an understanding of what’s really going on here. Uh-oh, Trump’s still talking. Clearly Bush’s strategery hasn’t worked. Frustrated, Bush removes the poncho. As he listens to Trump talk, Bush realizes once again that he really can’t take anymore. He becomes motivated to re-attempt entry into No Man’s Land. Success at last! Look how jealous Obama is!